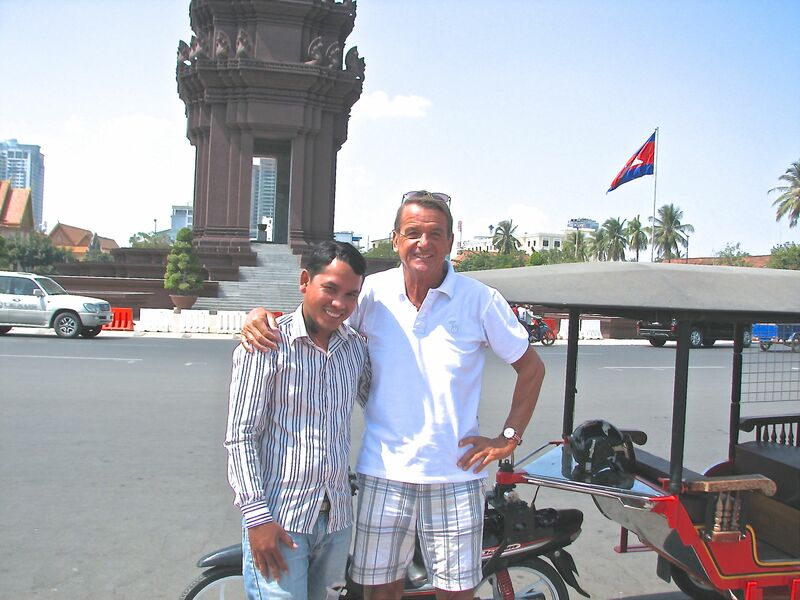 To try to find out a bit more about Phnom Penh and Cambodia as a whole I downloaded on Kindle a book by Henry Kamm the one time New York Times correspondent for South East Asia called simply Cambodia. It is pretty depressing reading I have to say. 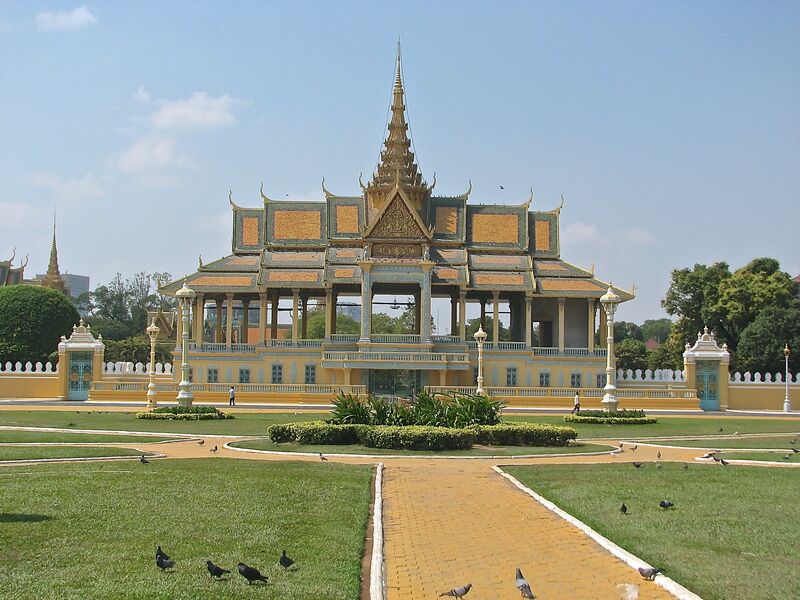 Basically the people of Cambodia have been let down by the people they elected to govern them, by the people they didn’t but who seized power, by a royal Prince who got into bed with anyone that might keep him in power and by the United Nations who were so busy trying to appease everyone they forgot they were there to protect the people. 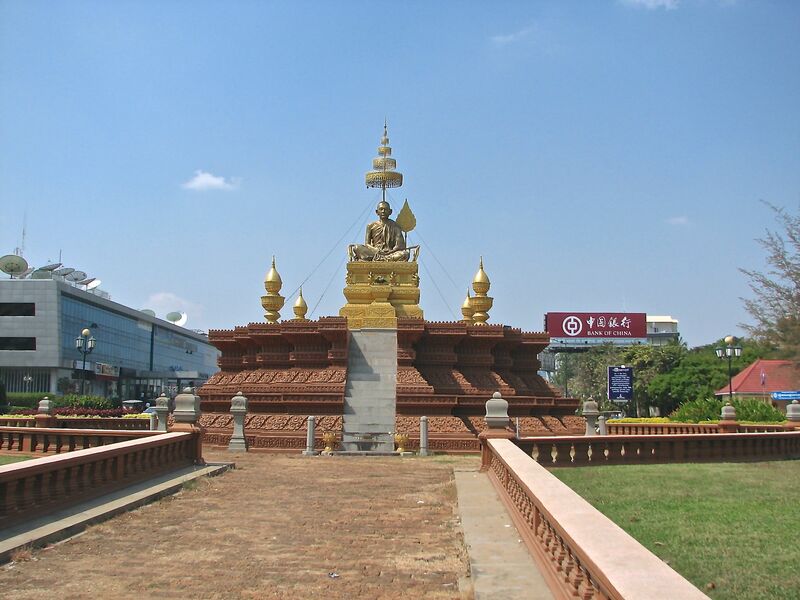 One amazing statistic if you need to know the suffering of ordinary people is that in 1970 Phnom Penh had a population of 470,000 people and by 1978 it had a population of just 32,000 souls. Pol Pot had seen to that and oh yes the Prince was in bed with him too. 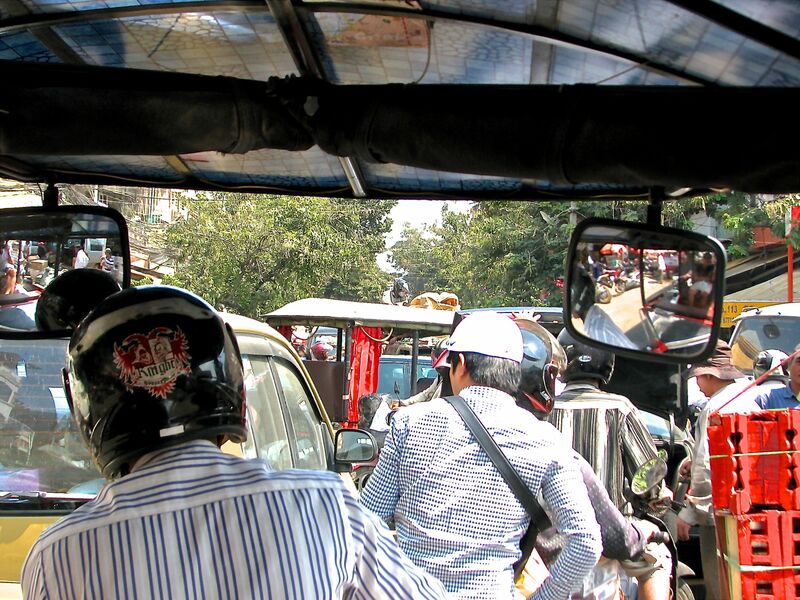 It now has a population of some 2.2 million people and we went out in a Tuk Tuk to have a look at the place. The real purpose was to go shopping ‘cos everyone says clothes are amazingly cheap here. 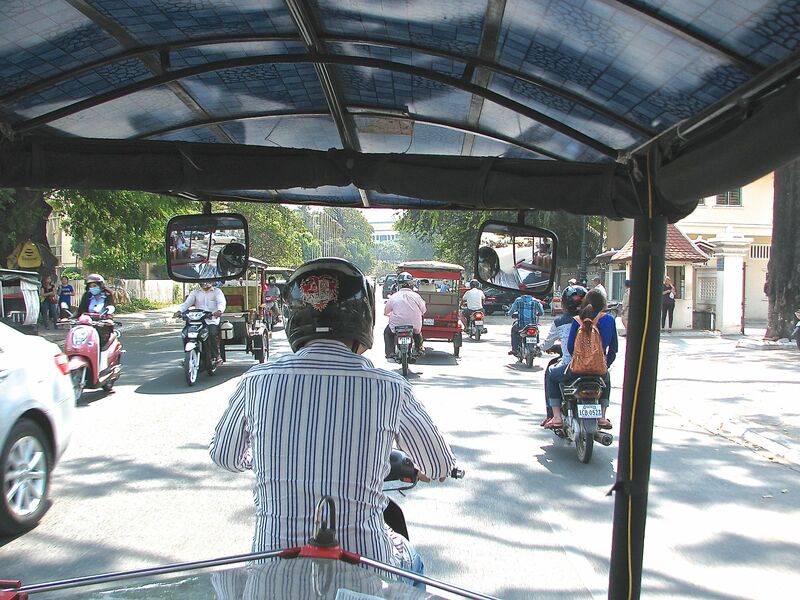 The lad who had driven us to our restaurant the night before seemed nice and he had fitted wire mesh to the sides of his tuk tuk, the first one to do this modification so we asked him to do the 3 hour trip. Apart from snatching from pedestrians the easiest way for a pillion rider on a motor bike to grab an handbag or package is to ride up alongside a Tuk Tuk reach in and grab it. The wire mesh you see prevents that. Very clever isn’t it ? 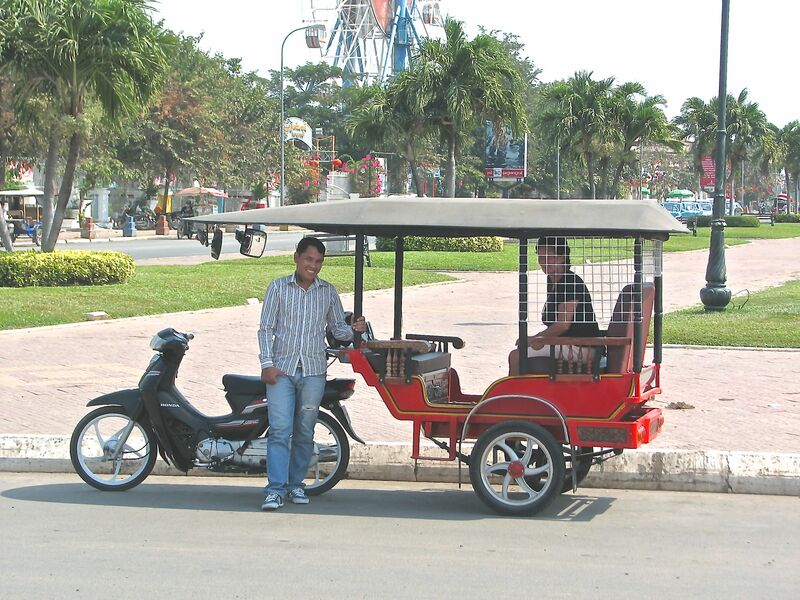 The Phnom Penh Tuk Tuks are more chariot in design with the bike being the horse. We set off at a very leisurely pace, these guys all seem to conserve fuel by going slowly. We drove all along the Quay side by the river. This area is just packed with restaurants and bars and great in the evening. I found a French place selling draught Angkor beer for US$0.50 cents a pint now that’s a real bargain. First stop The Royal Palace , no not a pub, keep up , the real thing. In my youth I dated for a time Lady Patricia Pelham Clinton Hope the Duke of Newcastle’s daughter. When phoning her one time from a pay phone near school I realised I had left her number back at the house. I called the operator and asked for the number of The Duke of Newcastle in Warminster. After a few minutes she came back and said I’ve got a White Swan and The Kings Head but no Duke of Newcastle. Again I had to say not the pub the person ! Now this is a statue of a professor who taught culture and was much revered by the people as he wrote many books about Cambodian culture. Instead of fleeing he stayed with his people and was murdered by Pol Pot. 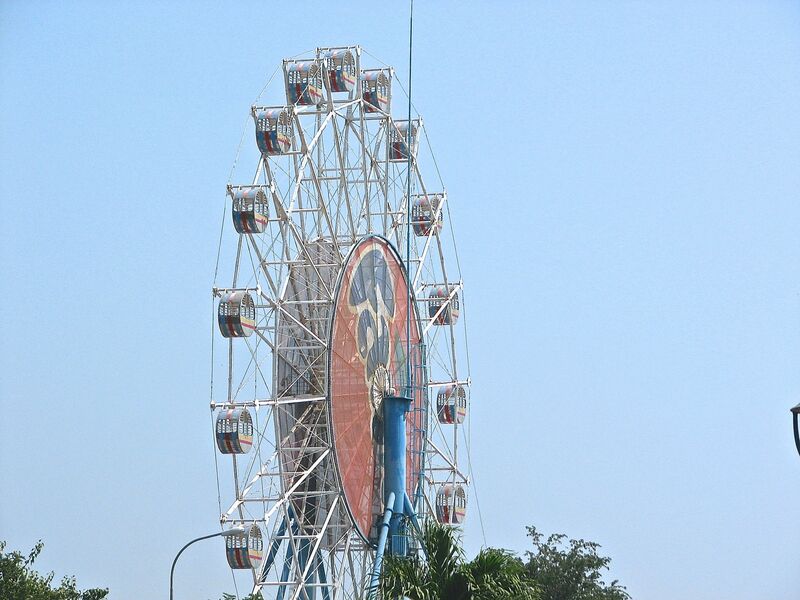 Most things in Phnom Penh are very new. 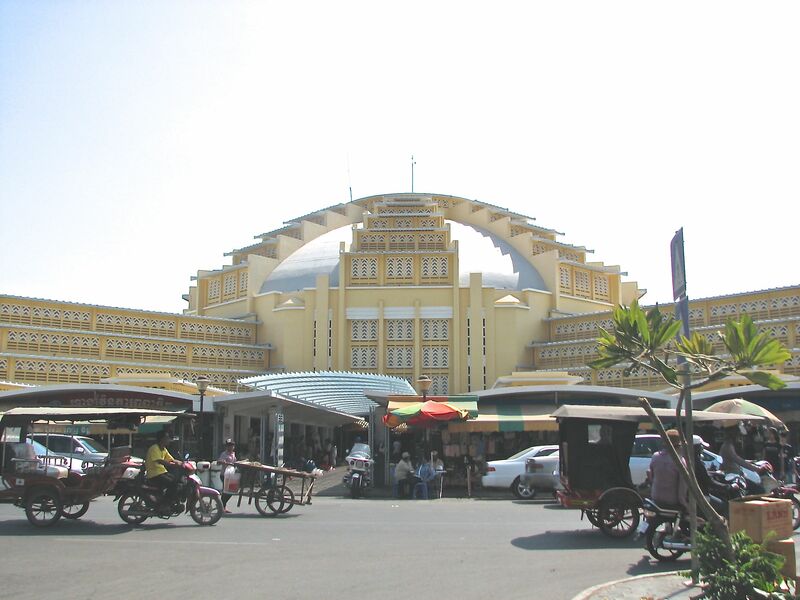 Pol Pot pretty well raised the place to the ground as he wanted a society of agricultural workers not city folk.. The rebuilding did keep most of the French big boulevards which is good and every roundabout seems to have a statue on it.They even have a kind of London Eye as well. We hit the Russian Market so called because after the Vietnamese invaded in 1979 to oust Pol Pot the market only stocked Russian goods. It took Gorbachev in 1985 who cut off aid to Vietnam to change all that and the Vietnamese quickly upped sticks and left. To be honest whilst the guide books all say it is the best for bargains almost all of it was the same stuff and no one really wanted to haggle or if they did it was to knock a dollar off perhaps. Try for more and they just looked disinterested and withdrew the goods. No fun at all as I love a good haggle. After 2 hours driving around we hit the Central Market and whilst again not much haggling they did try to sell stuff and there was a load more choice and thousands of fake watches as well as clothes. It was built in 1930 by the French in an art deco style and is huge inside. 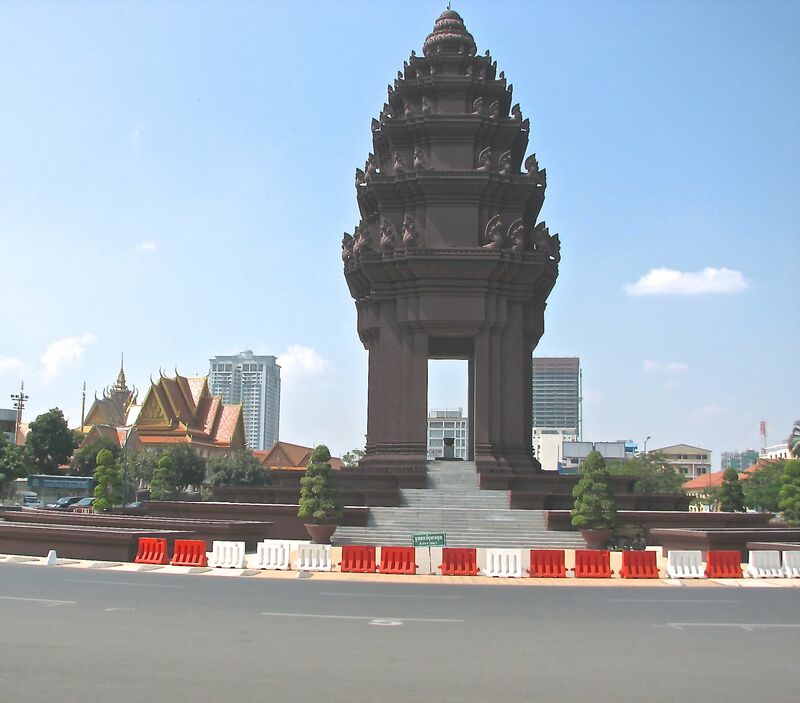 Phnom Penh is a lovely city and I would certainly come back to it again . Mind you the Raffles really does help you enjoy it. I gave our driver a big hug of thanks but he actually wanted US$15 as well. After 3 hours driving in that traffic he deserved it. Now it’s back to Saigon and the Tet New Year festival .Flowers and fireworks are on the menu now. On Jan 4th the ruling party here banned all form of street protests and gatherings. But yesterday protesters took to the streets to protest the turning down of a licence for a non government radio and TV station. The locals like in Vietnam take their lunch around 11a.m. so the protest came past Raffles at about 10 a.m. on it’s way to the Ministry of Information almost next door. As you would expect the breakfast is huge with table after table of different choices and the customary profusion of waiters and waitresses. We were part of the elite this morning tucking in to hearty breakfasts while just 200 metres away peaceful protesters were being beaten with sticks and riot shields. I don’t know enough yet about the politics of the country to start to understand it but maybe I won’t moan about the BBC Today programme quite as much when back in the UK or the simplistic Italian TV fare dished up over non state controlled airwaves. Mind you James Naughtie ….no don’t get me started. The baton charge coincided with a report published by the US Freedom House which ranked Cambodia as “not free” one of 48 countries in that category. The report cites that here ” basic political rights are absent” and ” basic civil liberties are widely and systematically denied “. It talks also of the ban on the right to assemble and a suppression of human rights since the disputed general election last year. But enough of politics let’s take our usual wander around this holel the way we have the others. That side of the play pool in the picture is always in the shade and the other side in the sun. Now that is service !! 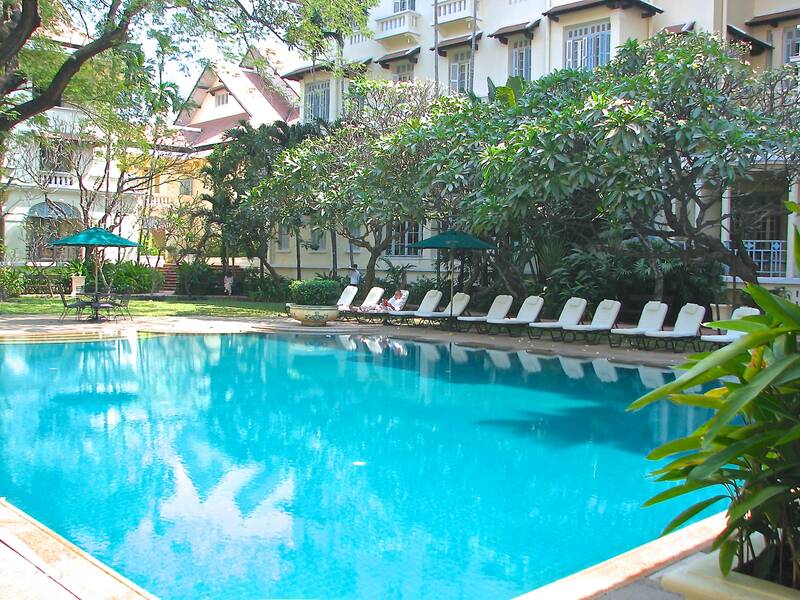 Our bedroom overlooks the play pool and has a pleasant balcony almost at pool level. 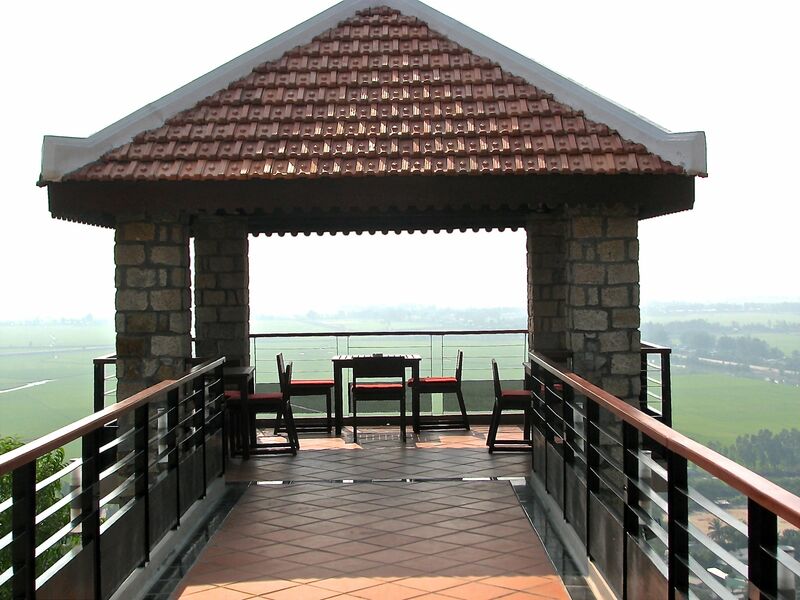 You have already seen the view from the breakfast table up the top of this blog . 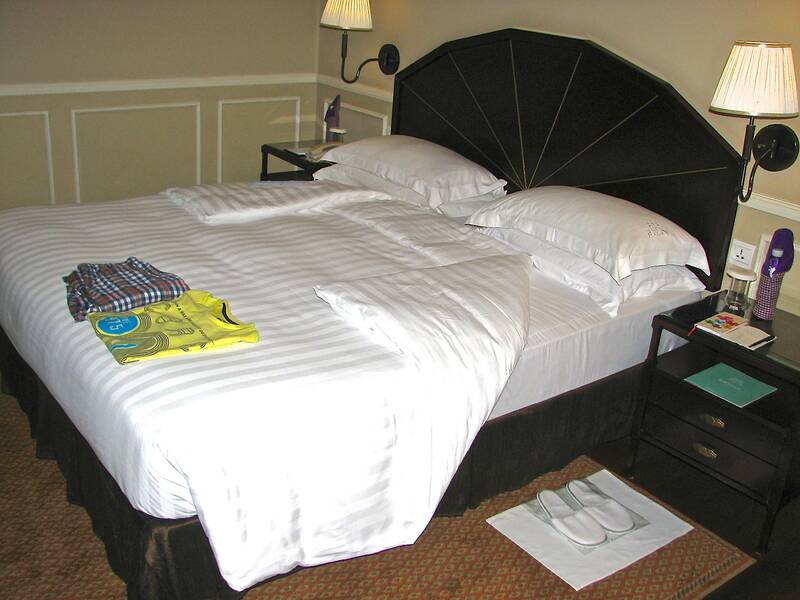 Not only is the bed turned down and the towels used for your evening shower replaced but slippers are laid out by the bed, a bottle of water and a glass placed on your bedside table, the room cleaned again, the bathroom completely wiped down, any clothes you left lying around hung up or folded neatly, the desk rearranged tidily and of course your PJs folded and laid on the bed. The bedside lights only are left on to make it really cosy when you stagger in from a night on the huge cocktails in the Elephant Bar. 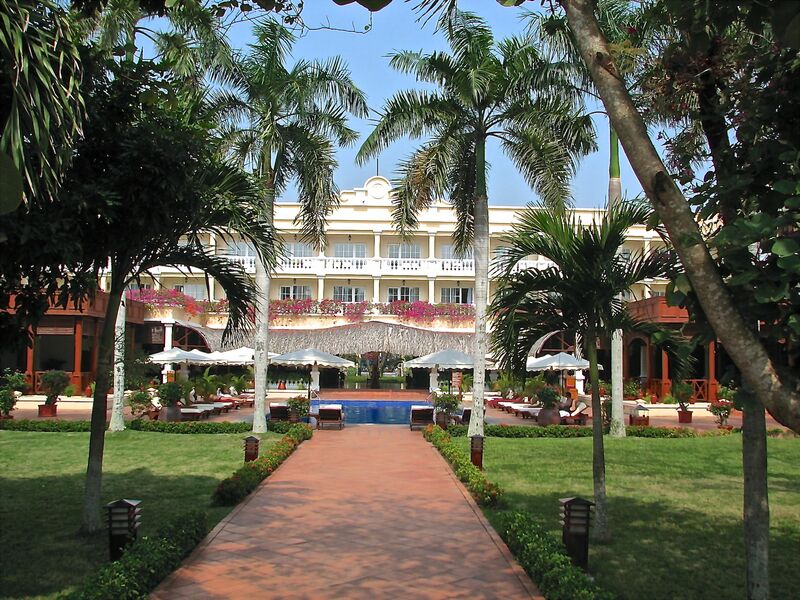 and home to a long list of celebrities including Jackie O and Somerset Maugham . The place is now crawling with NGO personnel who seem the mainstay of the economy as almost every charity seems to be present here in Cambodia. Not only do they drink here but many apparently live in this hotel as well. This seems very similar . It is big business now the charity game with lots of various national government monies flowing into them making them political as well as charitable schemes. In my youth I drank in various great hotel bars like the Long Bar in the old Raffles in Singapore where the Singapore Sling was born, the Long Bar at the Stanley Hotel in Nairobi which was already truncated from it’s original and now sadly gone and the rooftop bar at The Acropole Palace in Athens . I loved the feel of those places. Most great hotel bars are now priced way above what I am prepared to pay for a drink I can get outside for well under half the price. So it is nice to be back at one that certainly in happy hour is very affordable with beers at US$3, house cocktails at US$4 and special cocktails at US$ 6 and they come with three different snacks as well. That said I’m not sure I’d be too happy funding such prices from my own charity donation nor have my tax money paid by my government to a charity that was happy to have its people expense it for entertaining or worse still stay at the hotel and charge it to the charity. Last night we listened while a few NGO types moaned into their cocktails about the unfairness of their lot when diplomats got more leave per annum than them and more flights home each year as well. I guess join the elite few who pass the Civil Service Exams in the UK and change jobs would be my advice !! 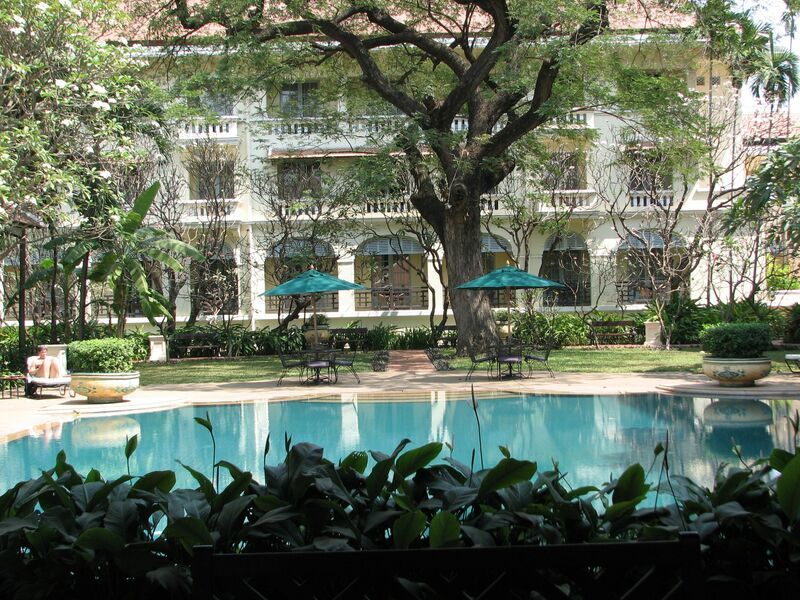 Well we made it up the Mekong to Phnom Penh and I am writing this sitting in the Elephant Bar of The Raffles Hotel there. What an hotel, superlatives hardly cover just how good the service is. A personal butler, hot and cold running staff everywhere and almost before you think of it someone is offering you that very it. The Singapore Slings are about to arrive. 50% off during a happy hour that stretches out from 4 p.m. till 9 p.m.. Bliss. Okay Singapore Slings aren’t very Phnom Penh but their local Raffles cocktail is La Femme Fatale which celebrates Jackie Kennedy’s visit here in 1967 and is champagne based which perhaps surprisingly I really don’t enjoy. But what of the trip up. Well in a word lengthy. According to their own timetable the trip was due to take 5 hours including a stop of one hour at the border to get visas . In fact the border stop was two hours and somehow they managed to add another hour to the travel time . So 7 hours either on the boat or hanging around at rather neglected riverside border control points. 24 passengers inside and 10 on the stern on a wooden bench. Strangely our boat was full of claustrophobics and so with no seat allocation the Ryanair/Southwest Airline rugby scrum to get on board and get a place was to sit on the wooden seats . We sauntered on board and sat downstairs. I think one of our problems was that the boat was completely full. Some 10 minutes after we left the pier in Chau Doc we pulled alongside an old junk and took on board a group of Polish and a group of Irish passengers. I guess the Brits on board could have had a field day with Irish jokes and the Americans with the Poles but the only American on board was a very serious fellow who nearly didn’t make it through the boarder ( nor did I ). Still it could have been worse we might have been on the above for the trip. mind you at times it felt as if we were. There was plenty of traffic on the river some small most large. and our boat driver took great delight in showing us his prowess at overtaking them by nipping around them at speed. After an hour we arrived at the Vietnam border post and sat around for an hour while they managed to stamp 34 exit stamps into 34 passports. 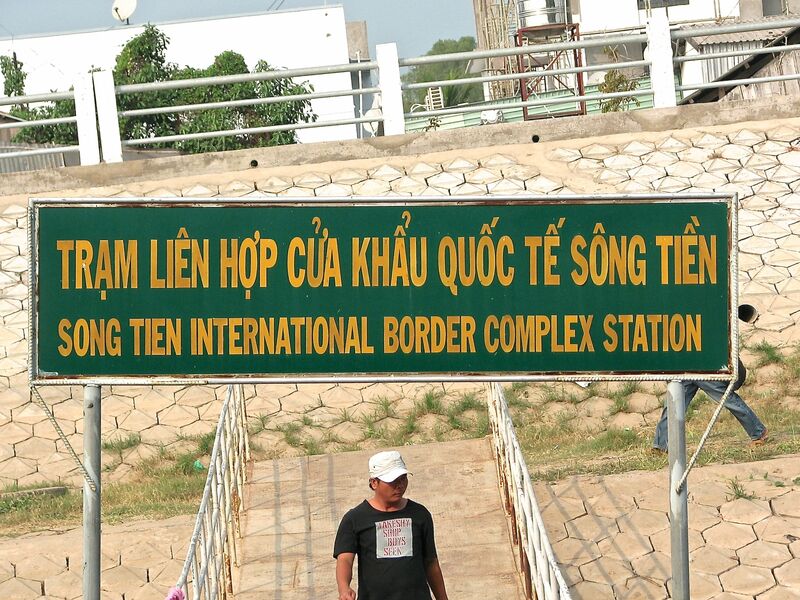 Given there were only 8 border guys I guess one can understand the delay ! After about 30 mins I and the American I mentioned earlier were delighted when our guide came back with our passports first. However it seemed neither of us had the supposedly necessary 3 blank pages in our passports to allow us entry into Cambodia. The guide who does the trip twice a day 6 days a week said he had never hear this rule before but we must pay a fine and select a page already taken with stamps for them to place the Cambodian full page visa. This we duly did and paid our “fine” of US$10 each. Forty minutes later we were all in possession of our passport with visas and then all had to go through Immigration to get back on the boat. While waiting in line I looked through the pages of my passport again and found 5 empty pages. This I mentioned to our guide and in an instant he had taken off with my passport. To be honest this wasn’t my intention . I stood there thinking he’s going to make a fuss, they are going to get nasty and I am not going to Phnom Penh today . But instead a beaming guide returned with my passport and my US$10 bribe in his hand. 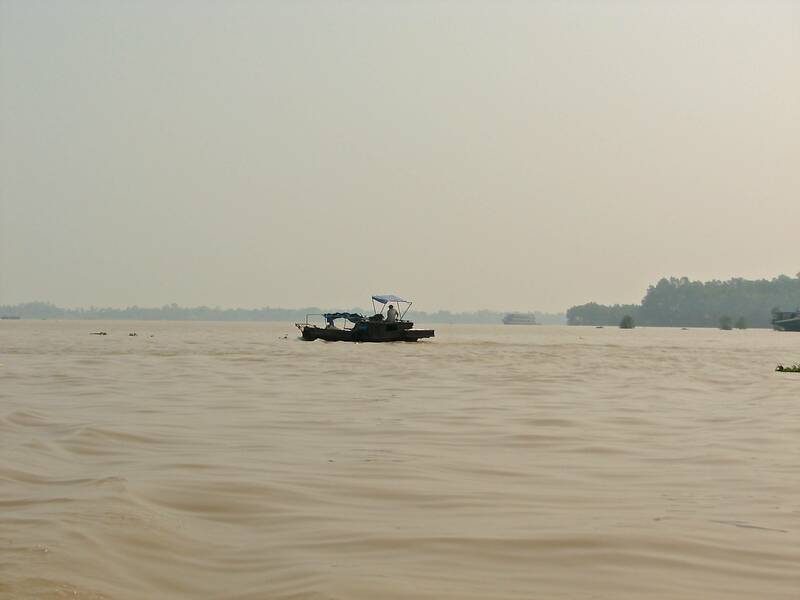 For four hours we then rattled along the Mekong River looking at ? Well looking at river banks one on either side just like ? Well just like other rivers though because this one was so wide it was hard to see them sometimes. Almost Henley on Thames don’t you think. 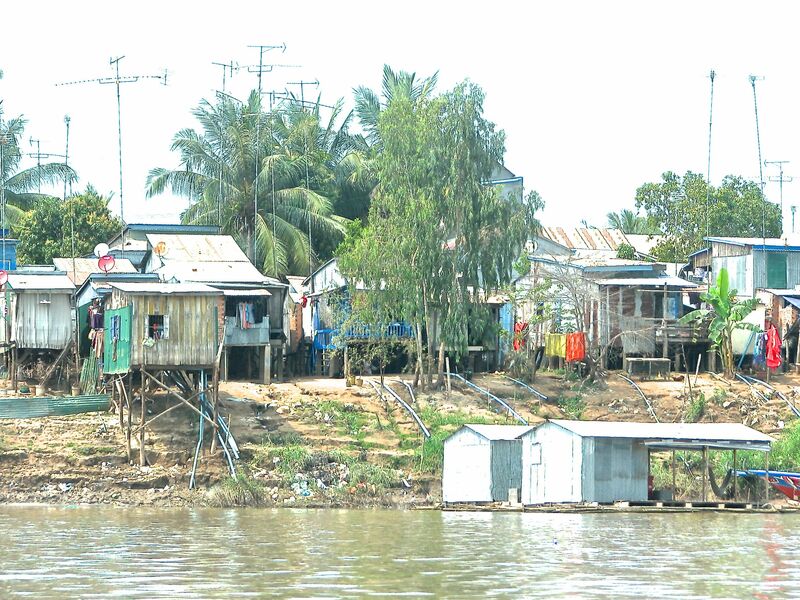 But in the main there was a great deal of water and those river banks.There was an audible sigh of relief as we rounded a bend and saw the small city of Phnom Penh in front of us . 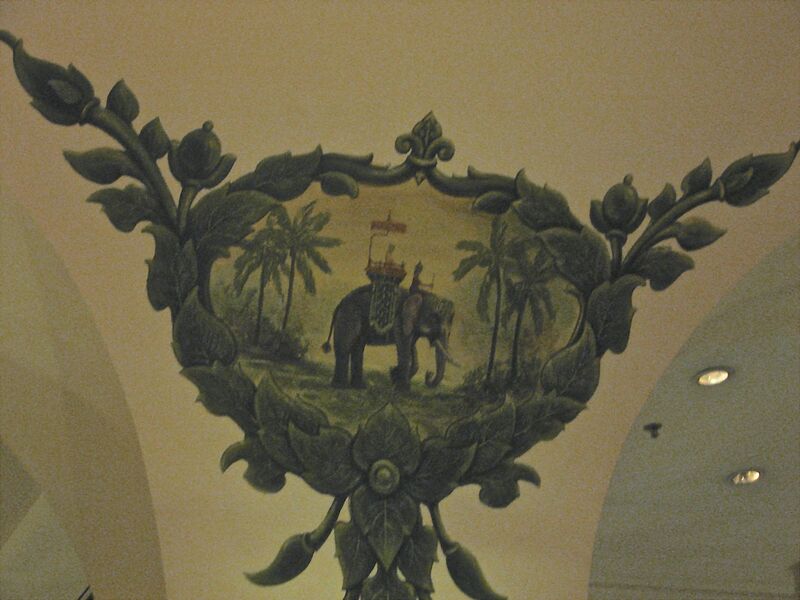 Our own reward is the fabulous Raffles Hotel and the glories of the Elephant Bar. On Wednesday we fly back to Saigon for Tet and the flight time is ? Well it is actually 40 minutes but hey what an adventure it’s been. Spent the day half way up Sam mound today. I could have gone to the Chau Doc floating market and seen the floating houses ( houseboats I guess) but decided against it. 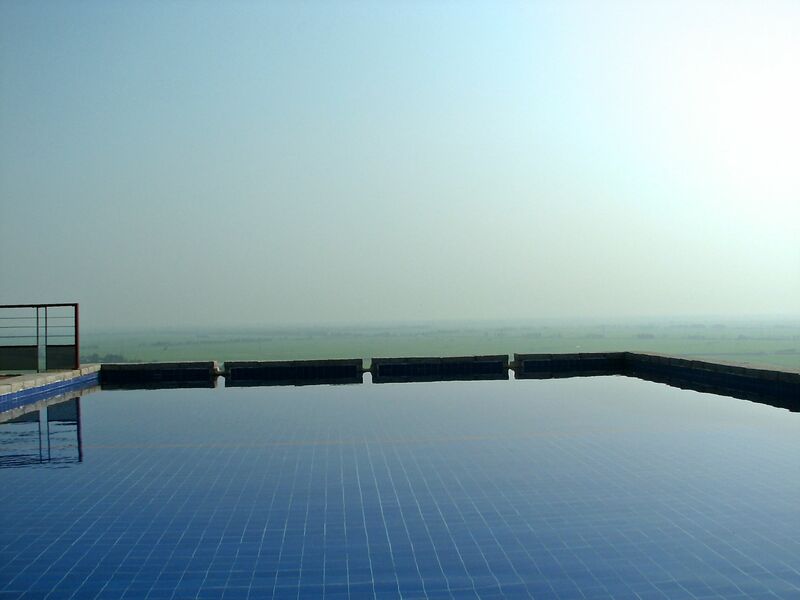 Leisurely breakfast I thought looking out over the paddy fields. Well up we went at 9.10 and it had all been cleared away. The staff most of whom are training as this hotel is also home to the Victoria Hotels Training Academy looked somewhat aghast . It was clear we had been forgotten. All the other groups had upped and gone en route to Cambodia and we fell through the net. They recovered well and produced the a la Carte menu and dragged the poor egg chef back upstairs. But leisurely it was not . We appear to be the only guests here today and have had the pool to ourselves once again. It has become a feature of our stays in out of the way places. To be fair the trainee’s are lovely and so eager to please just quite disorganised which seems to be so much a part of hotels in Vietnam unless they have a foreign General Manager. 43 of those little beauties and another 36 to get up to the dining area and reception. Housekeeping carry everything up and down the stairs as there are no trollies and so it is not surprising that the staff look unbelievably fit but with bulging leg muscles . 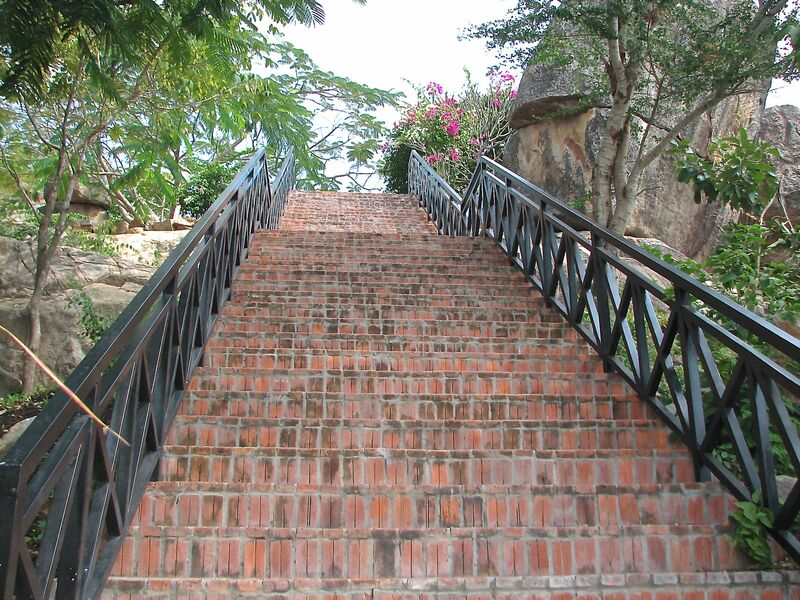 We stayed one time in an hotel in Kyrenia in Northern Cyprus and that had a quite a few steps but nothing like these. 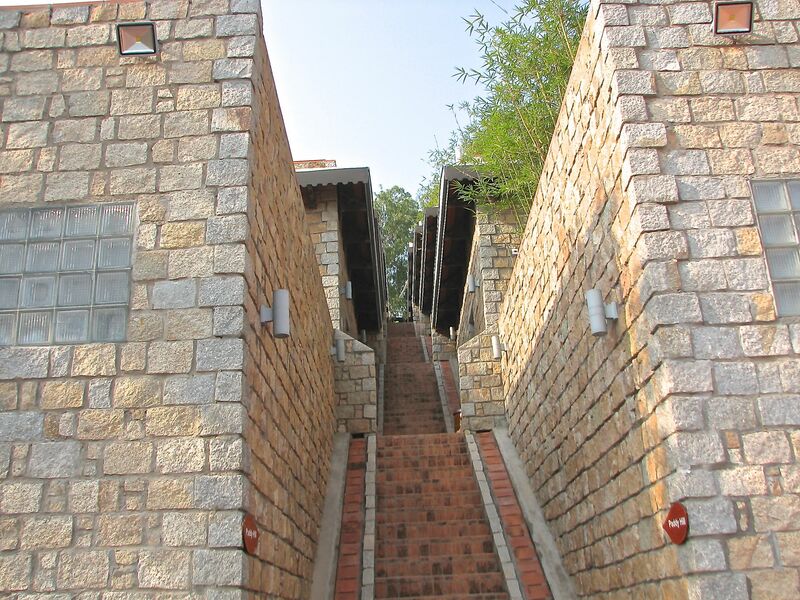 It was there I first heard about the complaint bungalow knees which is a condition most bungalow dwellers get when after a year in the bungalow they are faced with climbing stairs again on a regular basis. Chau Doc has been part of Vietnam for 300 years and before that it was part of Cambodia. more map drawing by the Europeans I would imagine. 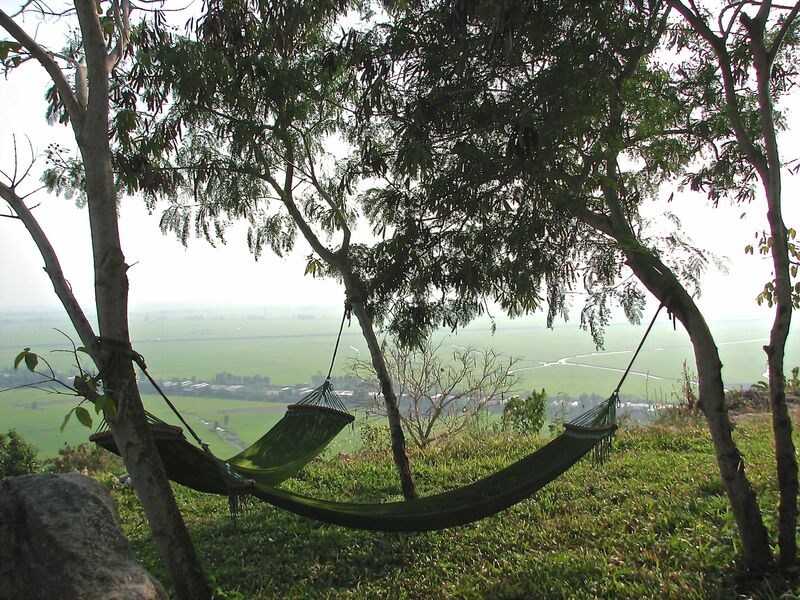 The hill the hotel stands on is very famous place of pilgrimage for the Vietnamese people. They come to worship the Lady of Sam at a temple further up the hill from us and some 2 million arrive each year. 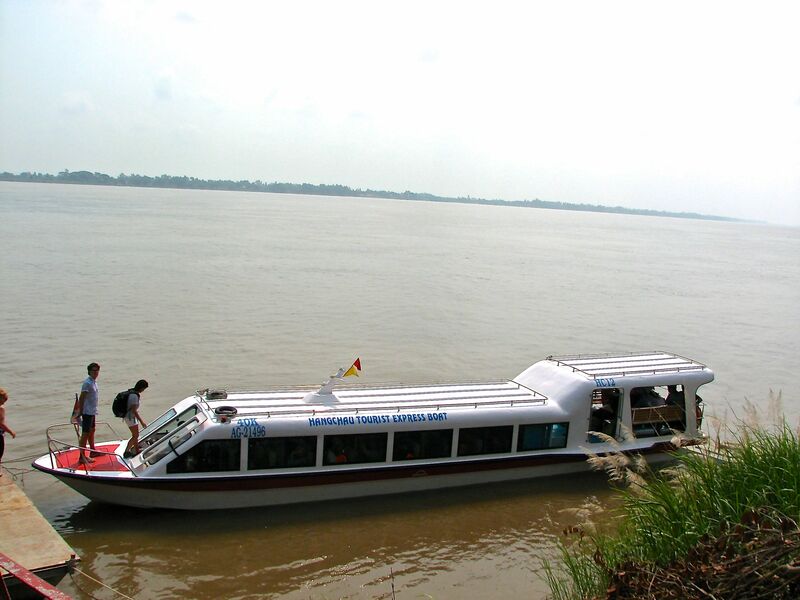 Tomorrow we leave here at 5.30 a.m. ( fire the tour operator someone) and take the early boat “up the Mekong” into Cambodia. When I went to sea with P&O in 1967 my second voyage was to bring what was then a huge tour group organised by the Australian Women’s Weekly magazine. They booked the entire ship and the average age of the participants most of who were women was 64years. The difference was amazing for a young purser cadet whose first and subsequent voyages had at least 500 girls between the age of 16 and 22 on board. We were required to entertain the passengers on deck at night but on this trip by 9 pm almost all were tucked up in bed fast asleep. I therefore spent a lot of time in the ship’s cinema watching the latest films and one of those was Khartoum which given the boredom factor of being on deck I think I saw about 10 times. One line in it stuck with me. When Gladstone played by Ralph Richardson says to General Gordon improbably played by Charlton Heston ” It’s up the Nile for you Gordon , up the Nile”. What a line, oh the romance. It was then I decided I wanted to spend much of my life living around the world. There were so many “up the Niles” I wanted to see and work in. and now I am up the Mekong. 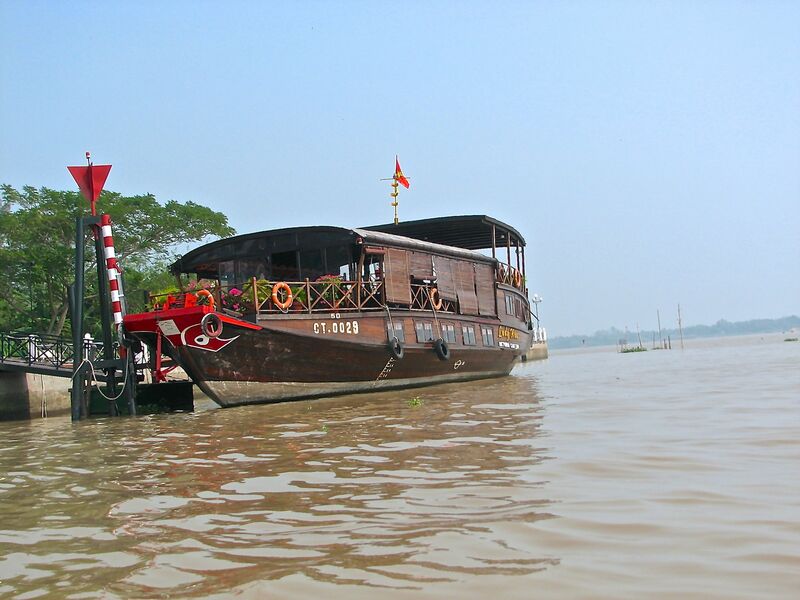 Today we drive on from Can Tho to Chau Doc along the banks of the Mekong south channel. The river rises some two thousand five hundred miles away in Tibet and flows down through China, Burma, Thailand, Laos and Cambodia before entering the South China Sea in Vietnam. At the height of the annual flood it is moving thirty eight thousand cubic metres of soil every second so no wonder it is so brown. 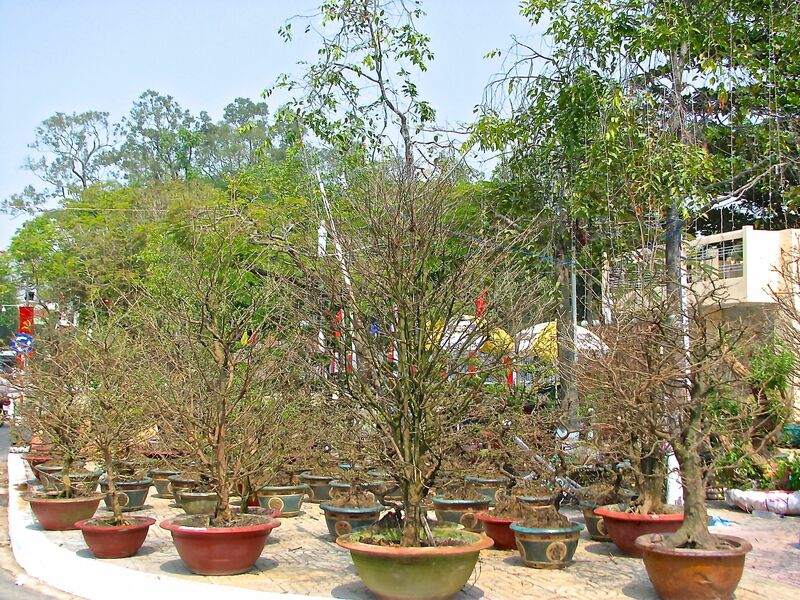 Vietnam, thanks to particles of soil from all those countries is growing at a rate of 200 feet per year.My thanks to Michael Palin for that rather useless piece of information. He was coming down the north channel of the Mekong when he penned that. Can Tho was a fun place and we had another good night out last night though Vietnam food still rather leaves me cold. I still haven’t really discovered what it is about. 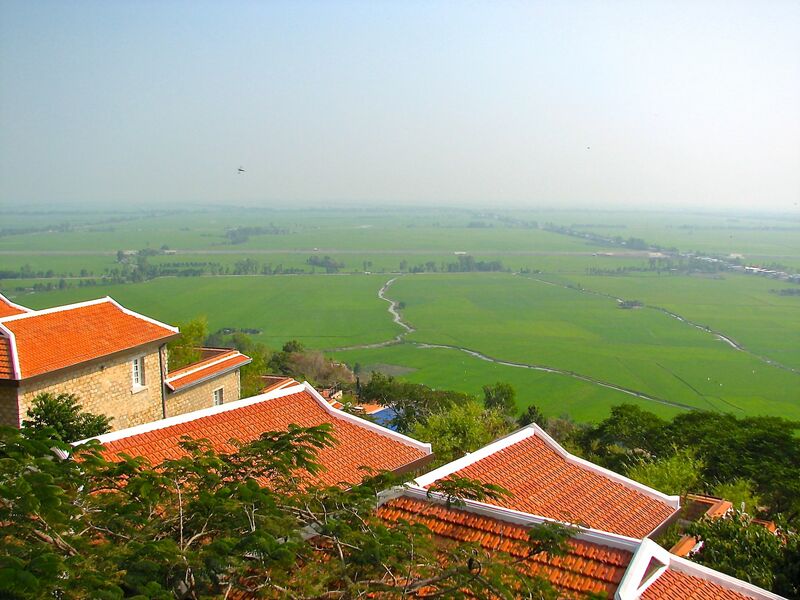 The city is the 4th largest in Vietnam and in Vietnamese the name means River of Poems. I have read the great reviews the Victoria hotel gets and am amazed. It is as I said yesterday a very noisy hotel ad to me the French owned place seems to typify what was wrong with French Colonial rule. Milk the locals dry ( in this case read hotel guests) and put little back in it’s place. The hotel certainly adds to the debate on whether a five or four star hotel that is unable or unwilling to supply drinkable tap water should charge for bottled water. I’m firmly in the no camp but the Victoria takes it one further by charging eleven times what a bottle costs in a shop. Now that really is gilding the lily . A small bottle of beer there costs 125,000 dong ( US$6) which is far more than in Saigon’s best hotels. The problem is they have a monopoly and get away with it though I quickly found a small local shop to get around it. They also have a monopoly here in Chau Doc having for years had the only decent hotel in town and now having opened a second up on the hill over looking the town . It is here we now rest our weary heads The Victoria Nui Sam Lodge. 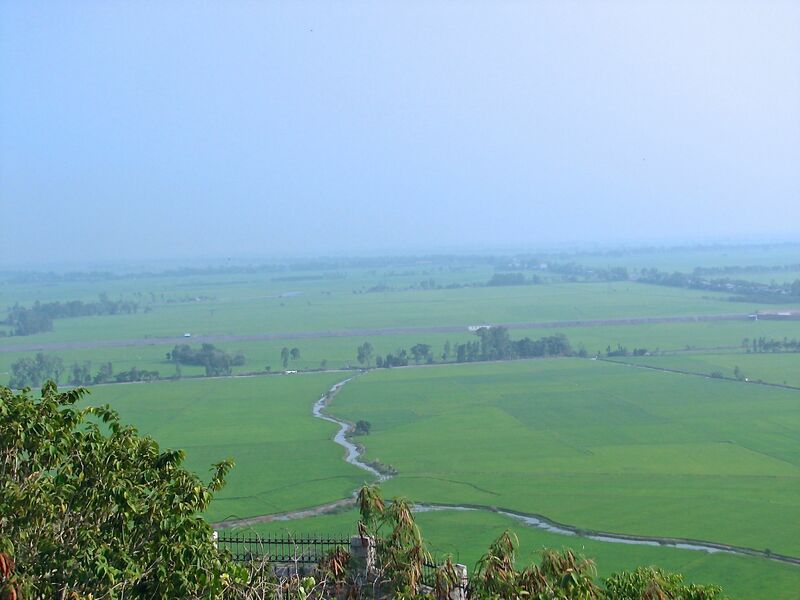 The Mekong Delta produces over half of Vietnam’s rice crop each year. Rice exports are the third largest export after seafood ( mainly shrimp and pastes) and timber. China takes almost all the rice, and the U.S. A. takes almost all of the seafood and the timber. Looks like we are set anyway. Mind you we got plenty of exercise getting the bags to the room. To beat the system I had the driver stop at a shop and bought 12 bottles of beer and a couple of sodas. Brilliant I though paying 25,000 dong for each beer, at usual Victoria prices that has saved me well over a million and a quarter dong. After staggering to the room under the weight of them I looked at the price list at this Victoria. Small bottle of beer 40,000 dong. The drive yesterday from Saigon to Can Tho took 3 hours and was certainly much easier than the drive to Mui Ne last month even though it is further. The road was dual carriage way for the most part and the driver got his toe down . You can stop at various temples on the way but we chose to get down to the hotel. After a couple of months in South East Asia you get templed out especially as it would have added some 2 hours to the journey. 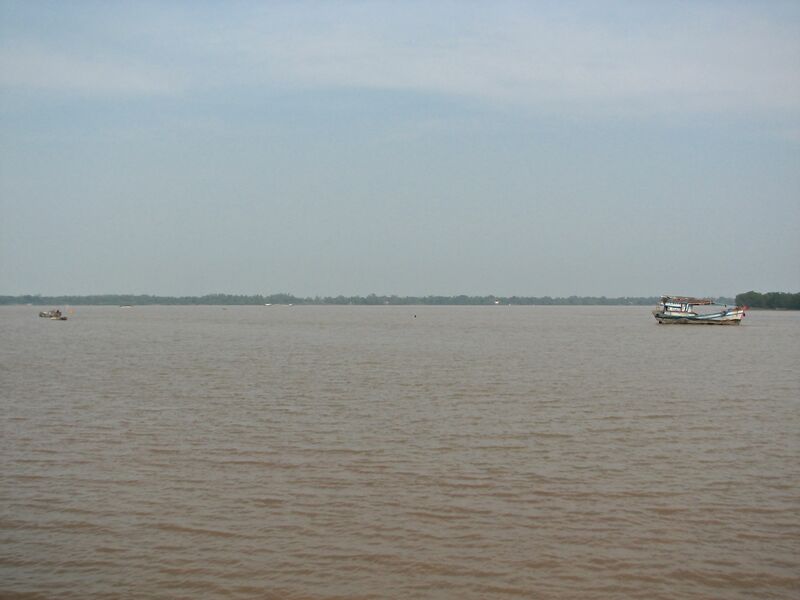 The Mekong delta is large. 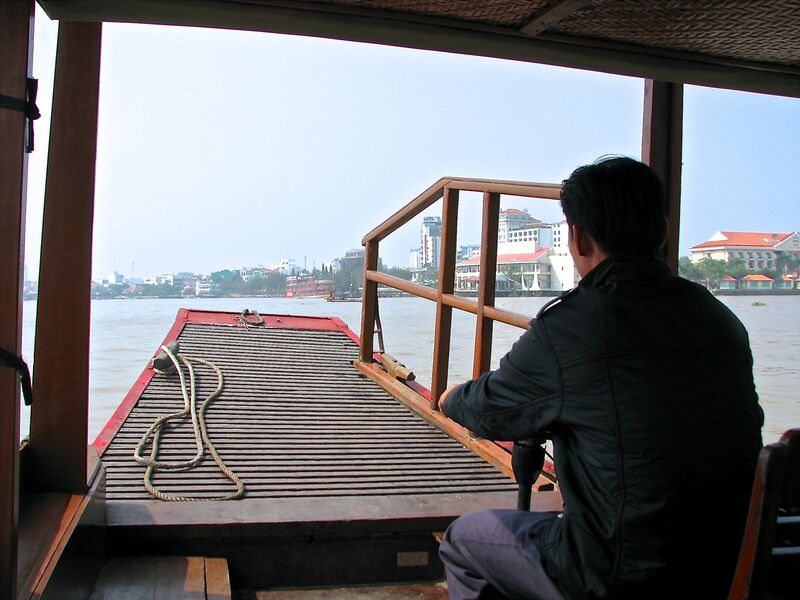 Several times we thought we were crossing the Mekong, each time though it was one of the many offshoots that meander their way to the coast. When we finally hit the real thing it was huge. 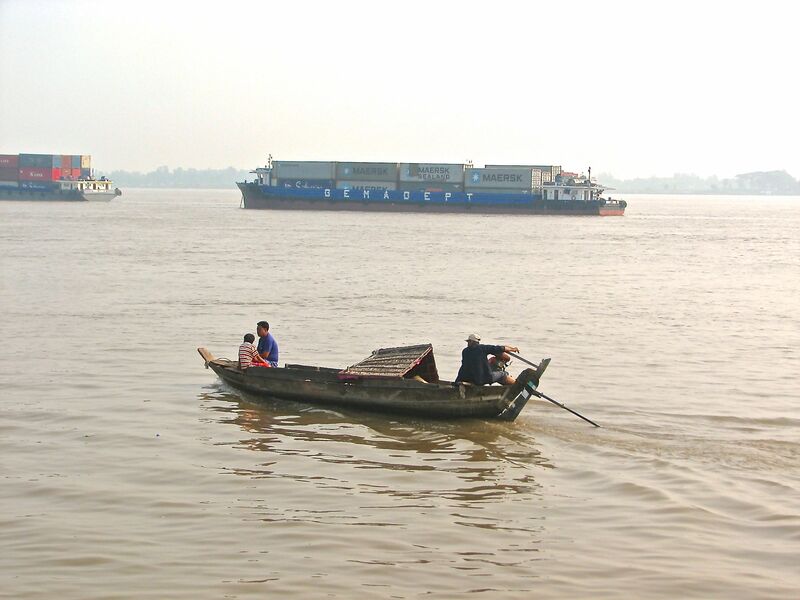 An enormous bridge spans the river close to Can Tho and as you look down the massive brown river is full of ships and barges. You can barely see the other side off in the distance. 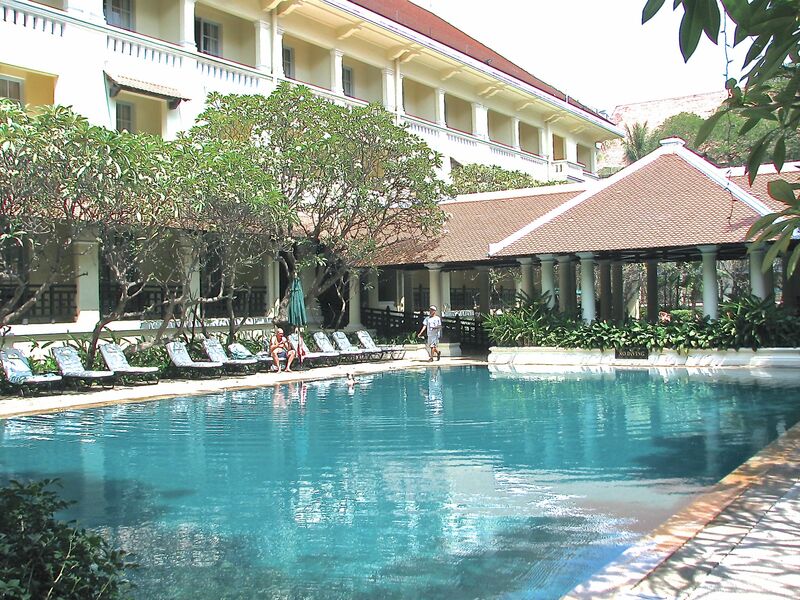 The Victoria is an old colonial hotel built by the French close to a town that is now a major port and industrial hub. The hotel itself is surrounded by large restaurants catering to the local populous and so during the day the various acts that entertain the diners practice their songs and music at full volume whilst a night they then do the act for real. So quiet it is not. 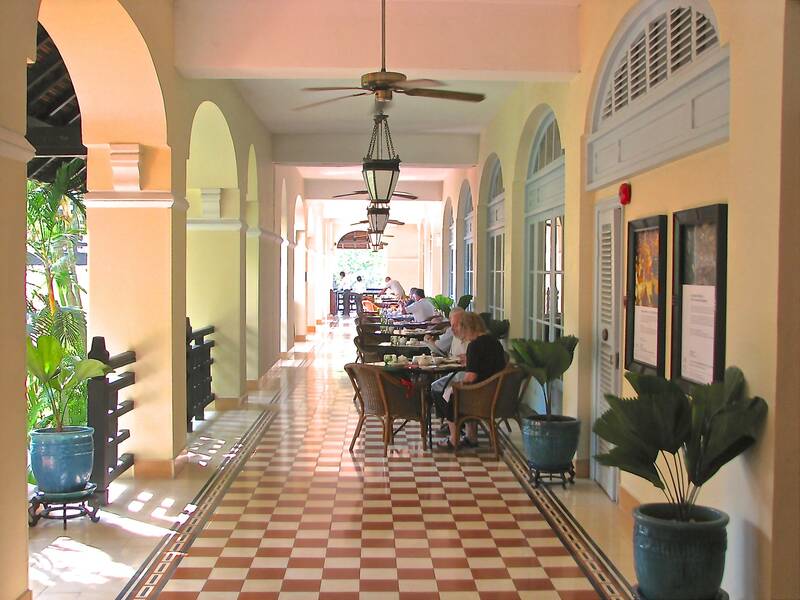 Nor is it a quiet hotel inside with marble corridors and teak floors accentuating the noise of people walking about. But the setting is superb and they do a lot well. the hotel prides itself on it’s green credentials hence the lawn growing on the top of the boat. 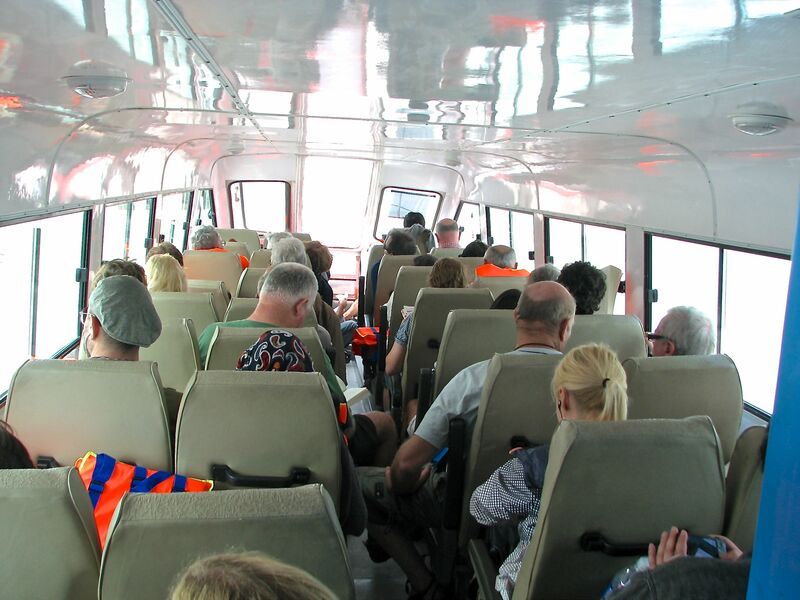 It is certainly a great way to head into the large town and the pier in town is the central point for the local restaurants that cater for foreigners and therefore speak some English. I was in this morning checking out places for tonight as in the dark last night we never really found the main area. The beer was cheap though and Can Tho produces it’s own local brew which you buy in various places for 9,000 dong (25P) a large glass. It is an acquired taste me thinks but at that price worth persevering with . 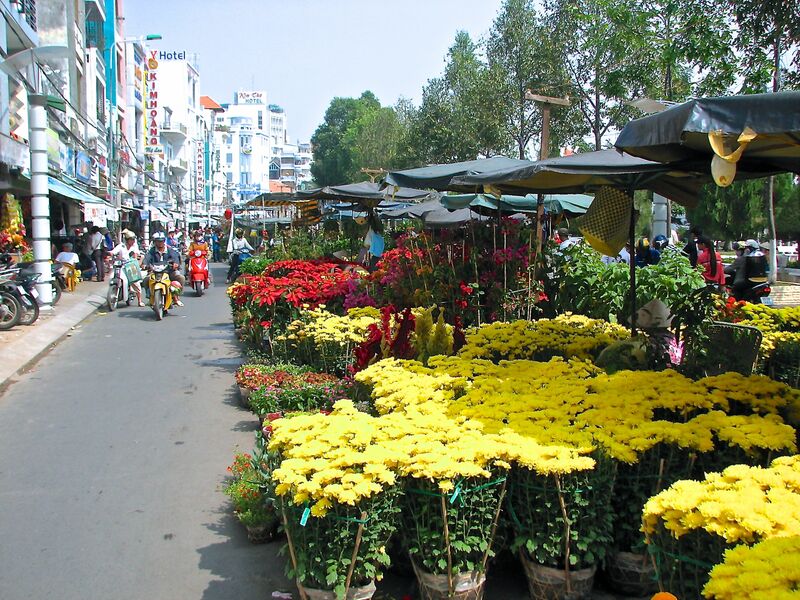 The market is full of flowers as people decorate everywhere ready for the Tet New Year holiday on Jan 31st. 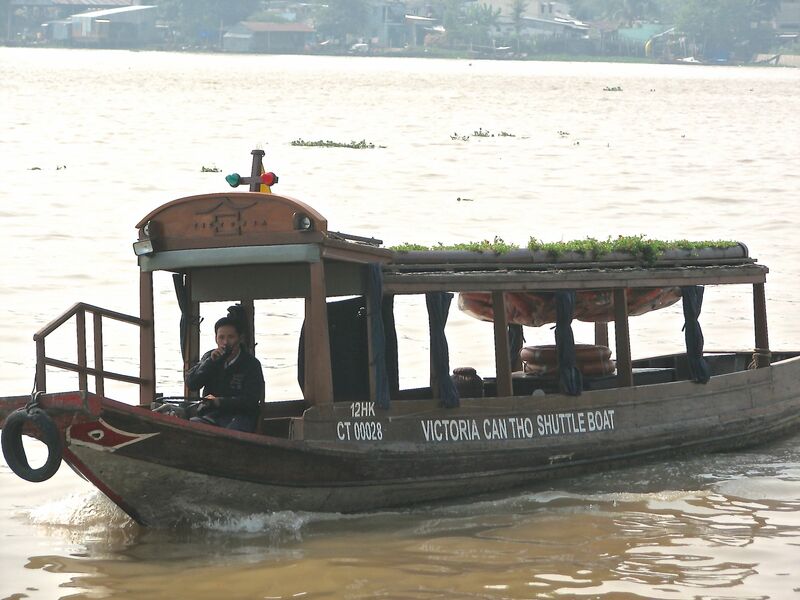 there is yet another floating market here as well that opens at 6 a.m. and closes at 8 a.m. also selling flowers. 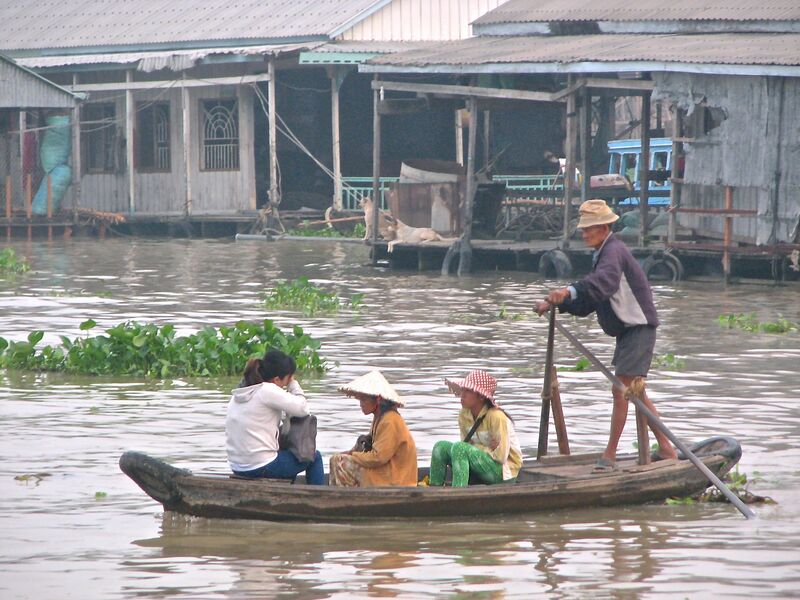 Were we tempted to go see another floating market ? Er no. The Tet is a 9 day holiday here in Vietnam for the first time under communist rule and the people seem determined to make the best of the new extended holiday. 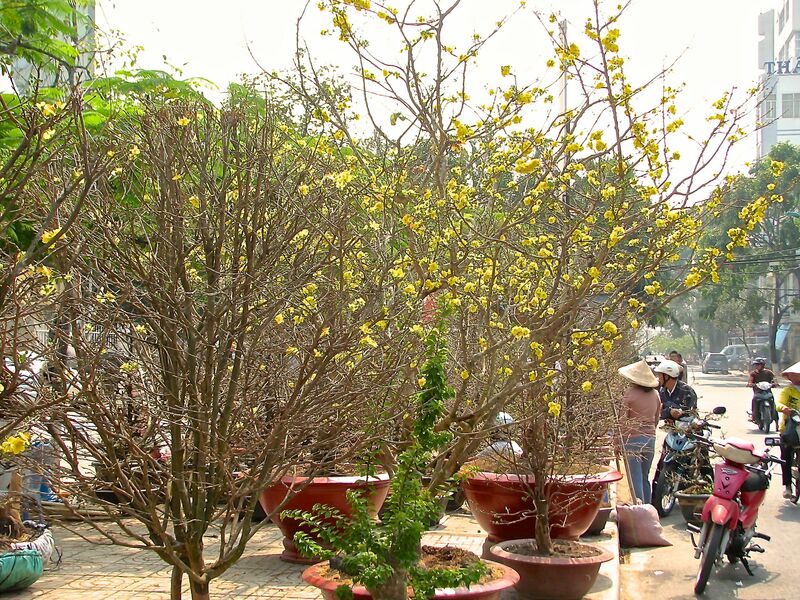 The big thing to have is a peach tree that flowers on the 1st of Feb to mark the new lunar new year so market sellers try to make sure they have the trees ready for this. not sure what they do with these now in bloom as nobody wants to buy them. It is a bit like buying a Christmas tree hoping that yours is not going to drop most of it’s needles before Christmas Day. In Canada I went out into nose bleed country north of Toronto to actually cut a tree myself. How fresh is that going to be I thought as I loaded it on the jeep. Back in town and worried that is might need water i put it in a bucket on the porch. The frost that night froze the water and within 2 days we had a bare tree rather like those peach ones. Kids weren’t happy let me say. So said Winston Churchill and of course it is true. Yesterday Jan 21st 46 years ago the Viet Cong began a series of attacks close to the Cambodia border having travelled down the Ho Chi Minh Trail through Laos. The idea was to draw the American troops out of the cities to handle them. It was the start of the Tet offence that changed the way the U.S. public viewed the war and bought about it’s conclusion several years later. For some time the American army had been telling the public at home and their own troops that the Viet Cong had taken such a beating they were no longer able to mount a large attack. General Westmoreland was fighting to a simple tactic . If he could kill more Viet Cong than they were able to recruit and train then he would win the war. The only two unknowns he had unfortunately were that he had little idea how many Viet Cong were being recruited nor how many were actually already in their Army. The Tet offensive was yet again a massive defeat for the Viet Cong but the idea that they could put over 80,000 troops in the field and attack most major towns including seizing the consulate building in the grounds of the U.S. Embassy in Saigon with ease put paid to the story the war was being won. The U.S. public started to really believe they were in an unwinnable war and so too did many of the troops. To mark the date I took a trip some 85 kms out of Saigon to visit the Cu Chi tunnels and see how the Viet Cong moved around areas underground . 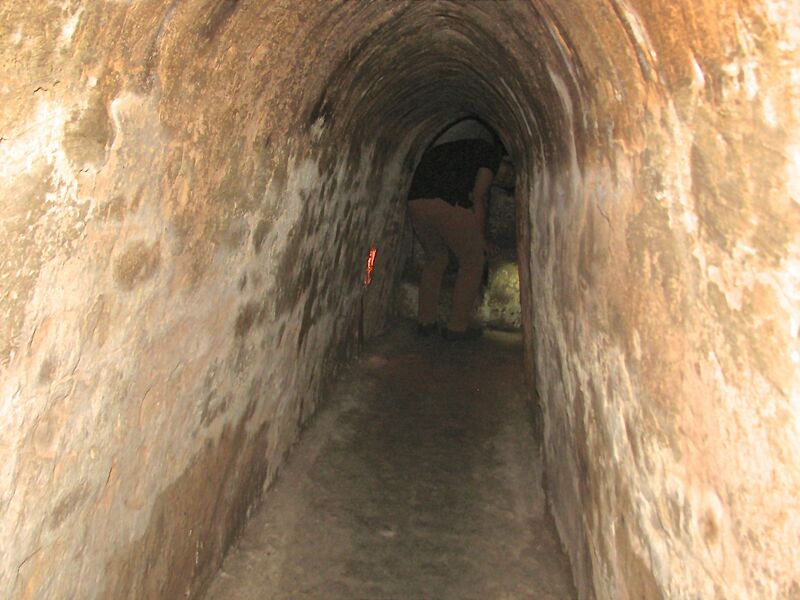 The tunnels were started in the 1940’s by farmers wanting to store their crops but were first used militarily during the independence war against the French after the French retook Vietnam at the end of WWII . 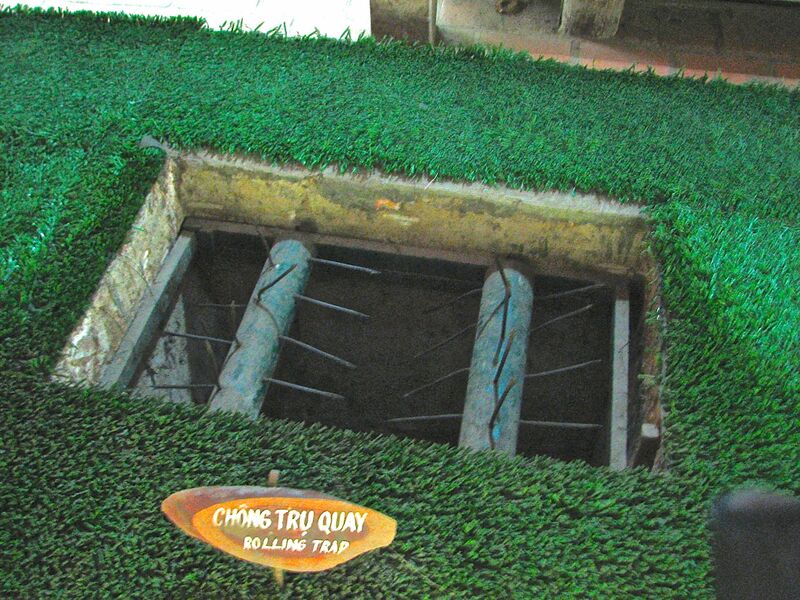 The Viet Cong then really developed the tunnel system in the area and at their peak there were some 200 kms of tunnels on three depth levels. On arrival you are led down into a large bunker and then sit through a film of the victors history of the war on a large screen. Afterwards a guy with one of those 5 foot long pointers that you see in WWII movies when the chap in charge says “gather around gentlemen ” and the points out on a large chart the objectives, did the same thing showing where the tunnels were and where the American troops were and how they were continually out fought and thought. Then we started the tour. First the bobby traps built to maim but not kill the U.S. troops so demoralising them. Covered with leaves and twigs these did terrible damage to feet and legs. 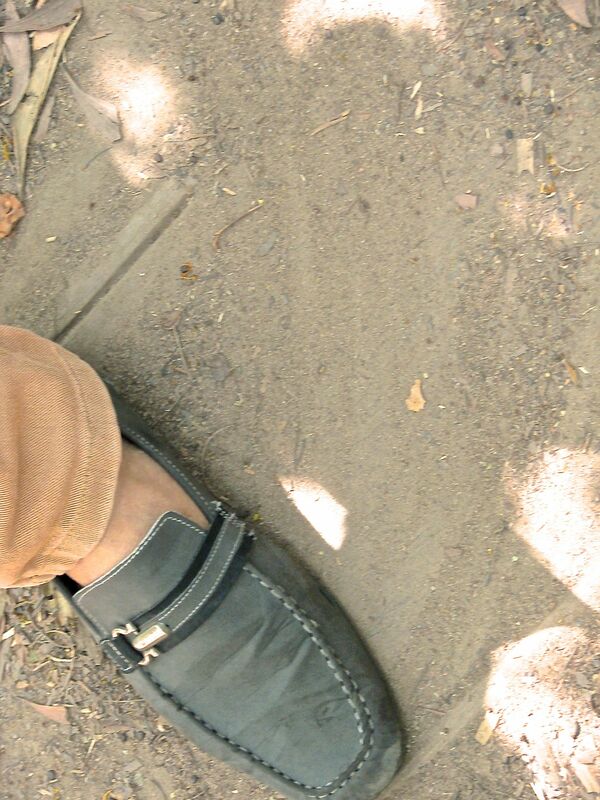 My guide’s shoe almost covers the door . The area was chosen because the soil is mainly clay giving the walls and more importantly the ceiling strength . 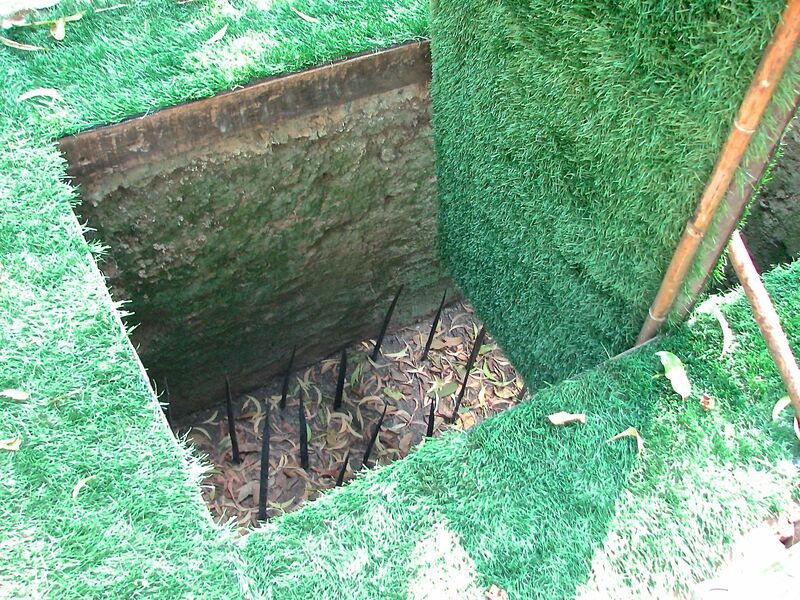 By building three levels they were able to bobby trap tunnels and offer up dead end tunnels . The two lower levels could withstand heavy bombing and shelling as well as drain off monsoon rains into the Saigon River . There were cookhouses, dormitories, command rooms and weapon store rooms all underground and connected by tunnels. All very Great Eascape. That is my small Vietnamese guide in front just standing up to go up a tunnel to the next level. It was tight even though these had been expanded for westerners and a little claustrophobic in the darkened areas. The root is in fact something most of us had at primary school for lunch and hated with a vengeance. Tapioca pudding . 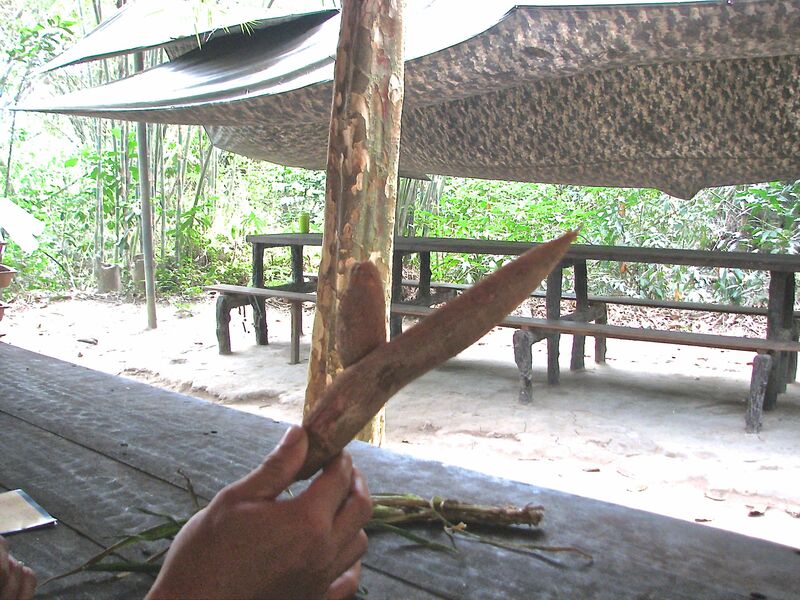 Here they just peel it and cut it into pieces and dip in peanut sauce. Quite nice really with a cup of tea. Why didn’t my dinner lady do that .